If you've never been to a CAbi party you should go. They are like Tupperware parties but for Carol Anderson clothing. The clothing is nice but expensive (for me at least, I'm cheap) and it's fun to look at your friends dressed in something that is totally not them. I never buy anything at CAbi parties but it is fun to hang out with my friends and try on clothing. The consultant knows I'm only there to pick over details and she always tells me that maybe I should go and design for Carol Anderson. Yea, as if. I always tell her the same thing. I'm a workhorse, I have skills, I can copy, but I CANNOT design or be creative on my own. I am not an artist. For me an artist is someone who creates using their own ideas. I always use a pattern. If I change it, it's because I've seen that detail on something else and want to copy it. And, I'm not looking for "Dawn you ARE an artist!" comments. I come from a family of artists (woodworker, potter, silversmith) and what they do is way different than what I do. So here are some excerpts from the fall and winter line. I did like a bunch of the details. I sit and draw while she is doing her presentation. First up, this cute pair of pants that was made out of a very thick bottom weight knit suiting. It was very interesting to touch. It had a bit of stretch. The details in the back where cute too. It had a notch at CB, seaming lines that ran down each leg, and a little buckle in the back. I loved this vest/jacket thing . . . until I tried it on. I love the colors on it and I love the design on other people. I think it was too baggy in front and that kind of threw the belt off. It just looked too big and made me look very flat chested. Which, of course, I am. This is why I sew my own clothes. There was a very cute t-back vest (far right) that I really liked. It was more slouchy than fitted. I think this Simplicity pattern is the same back but the CAbi vest is much loose; made to be worn open and flowing. The wrap dress (second on right) was made out of a beautiful fabric. It's an orchid purple with navy and black accents. You could totally use the Jalie wrap top pattern for this. Hmmmmm, there are more but my scanner has decided that it does not want to work. More on this later. I am new to Patternreview, and a relatively new follower of your blog-- thank you for sharing your thought process. And for sewing up all those Burda patterns, giving me tons of inspiration and insights. -- and I also feel that I can copy, imitate, change around design details etc, but that I am not a designer. Even though at my current skill level, these comments apply more to my knitting than my sewing -- have just taken up sewing garments again in June, after a 10 year or so hiatus. And boy am I learning. I totally understand where you are coming from - I couldn't "design" anything if my life depended on it. I am a copier! I'm a fellow non-artist. Engineering is more my thing. How can I get it to work better? What's the function here? (Fit, shape, utility, etc.) I love the way you look at things -- you're a resource for both artists AND engineers. I'm the same. Give me the design or the pattern and I'll make it...but design it??? Never. i think of this watching Project Runway. If i were there, I could sew up the designs faster than them, but they would have to give me the idea first. 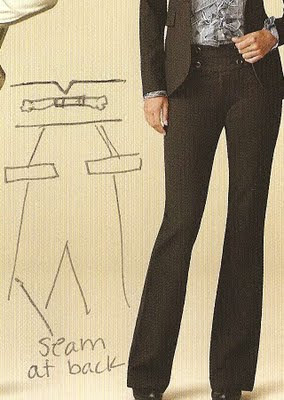 Check out some of the Burda counter paterns for interesting pant styles. Not in the pant section, but in the suit and sportswear part. I have seen pant styles like you show here. I agree with you - give me a pattern everytime, I can change it some but I need a direction. Thanks for posting the pictures. I am with you. I can follow a pattern and tweak, but I can't design my own -- yet!!!!!! When you elongate the Jalie wrap shirt to make it a dress, do you take a skirt pattern and sort-of draw down to get the rest of the dress? I have elongated a tunic pattern to make a dress, but that was supposed to be big. Something like the wrap shirt should be more fitted and that intimidates me a little more! Your first paragraph sums me up so well. I consider myself a workhorse, too (okay, not yet with sewing, but with paper crafts and party decor) - I can copy with the best of them, but I rarely come up with fresh ideas on my own. Hence, why I love doing projects and stuff for friends and family, but would never consider it for pay. I love that there are others out there that see themselves the same way. I have been to one CAbi party. It was fun. I liked looking at all the details also. I am a lot like you in that I can copy till the cows come home but rarely think up something on my own. I love all the inspiration I get from reading blogs like yours. anyone have any past season/years cabi catalogs they want to get rid of? If you do let me know and i will buy them from you! All I gotta say is . . .